Astronomers based at the University of Sheffield have found evidence that stars are ripped apart by supermassive black holes 100 times more often than previously thought. Until now, such stellar cannibalism – known as Tidal Distruption Events, or TDEs – had only been found in surveys which observed many thousands of galaxies, leading astronomers to believe they were exceptionally rare: only one event every 10,000 to 100,000 years per galaxy. 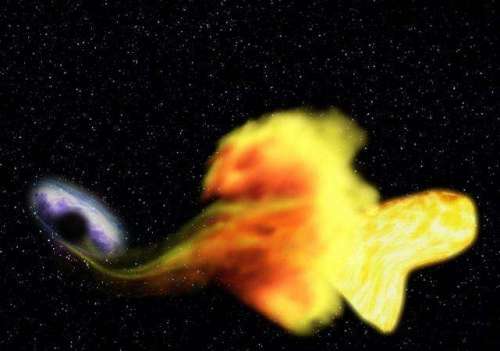 However, the pioneering study conducted by leading scientists from the University’s Department of Physics and Astronomy, recorded a star being destroyed by a supermassive black hole in a survey of just 15 galaxies – an extremely small sample size by astronomy standards. “Each of these 15 galaxies is undergoing a ‘cosmic collision’ with a neighbouring galaxy,” said Dr James Mullaney, Lecturer in Astronomy and co-author of the study. The supermassive black holes that lurk in the hearts of all large galaxies can be elusive. This is because they don’t shine in a conventional sense due to their gravity being so strong that nothing can escape, not even light itself. However, the release of energy as stars are ripped apart when they move close to the black holes leads to dramatic flares. The galaxies’ nuclei can then appear as bright as all the billions of stars in a typical galaxy combined. In this way, TDEs can be used to locate otherwise dim black holes and study their strong gravity and how they accrete matter. “Our team first observed the 15 colliding galaxies in the sample in 2005, during a previous project,” said Rob Spence, University of Sheffield PhD student and co-author of the study. The particular combination of variability and post-flare spectrum observed in F01004-2237 – which is 1.7 billion light years from Earth – was unlike any known supernova or active galactic nucleus, but characteristic of TDEs. Clive Tadhunter, Professor of Astrophysics and leader of the study, said: “Based on our results for F01004-2237, we expect that TDE events will become common in our own Milky Way galaxy when it eventually merges with the neighbouring Andromeda galaxy in about 5 billion years. Based on their densities, all of the TRAPPIST-1 planets are likely to be rocky. Further observations will not only help determine whether they are rich in water, but also possibly reveal whether any could have liquid water on their surfaces. The mass of the seventh and farthest exoplanet has not yet been estimated — scientists believe it could be an icy, “snowball-like” world, but further observations are needed. In contrast to our sun, the TRAPPIST-1 star — classified as an ultra-cool dwarf — is so cool that liquid water could survive on planets orbiting very close to it, closer than is possible on planets in our solar system. All seven of the TRAPPIST-1 planetary orbits are closer to their host star than Mercury is to our sun. The planets also are very close to each other. If a person were standing on one of the planet’s surface, they could gaze up and potentially see geological features or clouds of neighboring worlds, which would sometimes appear larger than the moon in Earth’s sky. Spitzer, an infrared telescope that trails Earth as it orbits the sun, was well-suited for studying TRAPPIST-1 because the star glows brightest in infrared light, whose wavelengths are longer than the eye can see. In the fall of 2016, Spitzer observed TRAPPIST-1 nearly continuously for 500 hours. Spitzer is uniquely positioned in its orbit to observe enough crossing — transits — of the planets in front of the host star to reveal the complex architecture of the system. Engineers optimized Spitzer’s ability to observe transiting planets during Spitzer’s “warm mission,” which began after the spacecraft’s coolant ran out as planned after the first five years of operations. 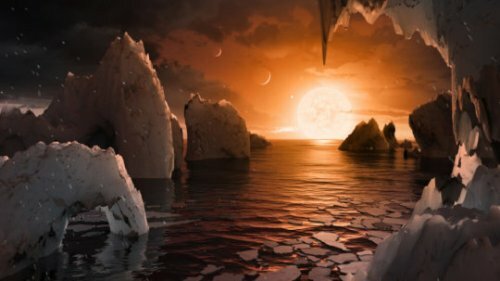 “The TRAPPIST-1 system provides one of the best opportunities in the next decade to study the atmospheres around Earth-size planets,” said Nikole Lewis, co-leader of the Hubble study and astronomer at the Space Telescope Science Institute in Baltimore. NASA’s planet-hunting Kepler space telescope also is studying the TRAPPIST-1 system, making measurements of the star’s minuscule changes in brightness due to transiting planets. Operating as the K2 mission, the spacecraft’s observations will allow astronomers to refine the properties of the known planets, as well as search for additional planets in the system. The K2 observations conclude in early March and will be made available on the public archive. Spitzer, Hubble, and Kepler will help astronomers plan for follow-up studies using NASA’s upcoming James Webb Space Telescope, launching in 2018. With much greater sensitivity, Webb will be able to detect the chemical fingerprints of water, methane, oxygen, ozone, and other components of a planet’s atmosphere. Webb also will analyze planets’ temperatures and surface pressures — key factors in assessing their habitability. 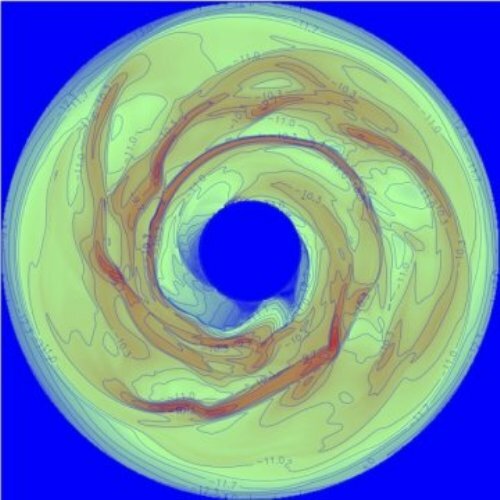 New planetary formation models from Carnegie’s Alan Boss indicate that there may be an undiscovered population of gas giant planets orbiting around Sun-like stars at distances similar to those of Jupiter and Saturn. His work is published by The Astrophysical Journal. The population of exoplanets discovered by ongoing planet-hunting projects continues to increase. These discoveries can improve models that predict where to look for more of them. The planets predicted by Boss in this study could hold the key to solving a longstanding debate about the formation of our Solar System’s giant planets out of the disk of gas and dust that surrounded the Sun in its youth. One theory holds that gas giants form just like terrestrial planets do — by the slow accretion of rocky material from the rotating disk — until the object contains enough material to gravitationally attract a very large envelope of gas around a solid core. The other theory states that gas giant planets form rapidly when the disk gas forms spiral arms, which increase in mass and density until distinct clumps form that coalesce into baby gas giant planets. 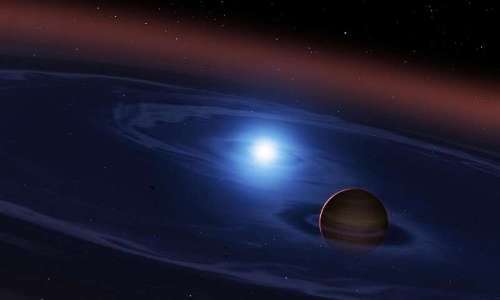 One problem with the first option, called core accretion, is that it can’t explain how gas giant planets form beyond a certain orbital distance from their host stars — a phenomenon that is increasingly found by intrepid planet hunters. However, models of the second theory, called disk instability, have indicated the formation of planets with orbits between about 20 and 50 times the distance between Earth and the Sun. “NASA’s upcoming Wide Field Infrared Survey Telescope may be ideally suited to test my predictions here,” Boss added. New research from The University of Texas at Austin reveals that the Earth’s unique iron composition isn’t linked to the formation of the planet’s core, calling into question a prevailing theory about the events that shaped our planet during its earliest years. The research, published in Nature Communications on Feb. 20, opens the door for other competing theories about why the Earth, relative to other planets, has higher levels of heavy iron isotopes. Among them: light iron isotopes may have been vaporized into space by a large impact with another planet that formed the moon; the slow churning of the mantle as it makes and recycles the Earth’s crust may preferentially incorporate heavy iron into rock; or, the composition of the raw material that formed the planet in its earliest days may have been enriched with heavy iron. An isotope is a variety of atom that has a different weight from other atoms of the same element because it has a different numbers of neutrons. Jin Liu, now a postdoctoral researcher at Stanford University, led the research while earning his Ph.D. at the Jackson School. Collaborators include scientists from The University of Chicago, Sorbonne Universities in France, Argonne National Laboratory, the Center for High Pressure Science and Advanced Technology Research in China, and the University of Illinois at Urbana-Champaign. Rock samples from other planetary bodies and objects — ranging from the moon, to Mars, to ancient meteorites called chondrites — all share about the same ratio of heavy to light iron isotopes. In comparison to these samples from space, rocks from Earth have about 0.01 percent more heavy iron isotopes than light isotopes. That might not sound like much, but Lin said it’s significant enough to make the Earth’s iron composition unique among known worlds. Lin said that one of the most popular theories to explain the Earth’s iron signature is that the relatively large size of the planet (compared with other rocky bodies in the solar system) created high pressure and high temperature conditions during core formation that made different proportions of heavy and light iron isotopes accumulate in the core and mantle. 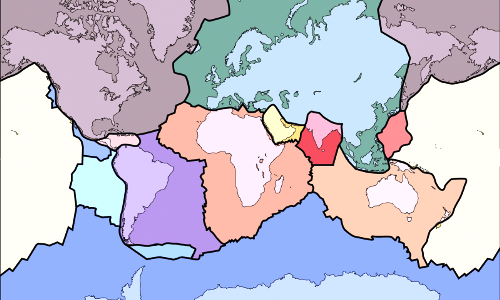 This resulted in a larger share of heavy iron isotopes bonding with elements that make up the rocky mantle, while lighter iron isotopes bonded together and with other trace metals to form the Earth’s core. 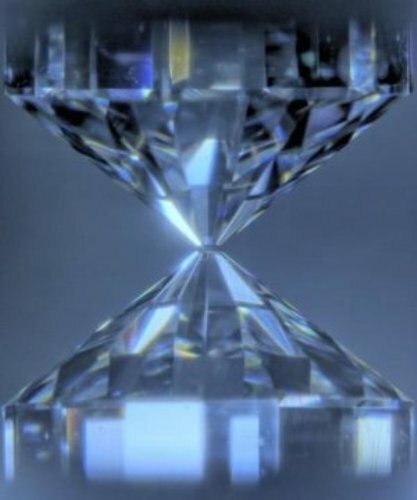 But when the research team used a diamond anvil to subject small samples of metal alloys and silicate rocks to core formation pressures, they not only found that the iron isotopes stayed put, but that the bonds between iron and other elements got stronger. Instead of breaking and rebonding with common mantle or core elements, the initial bond configuration got sturdier. “Our high pressure studies find that iron isotopic fractionation between silicate mantle and metal core is minimal,” said Liu, the lead author. Co-author Nicolas Dauphas, a professor at the University of Chicago, emphasized that analyzing the atomic scale measurements was a feat unto itself. Helen Williams, a geology lecturer at the University of Cambridge, said it’s difficult to know the physical conditions of Earth’s core formation, but that the high pressures in the experiment make for a more realistic simulation. “This is a really elegant study using a highly novel approach that confirms older experimental results and extends them to much higher pressures appropriate to the likely conditions of core-mantle equilibrium on Earth,” Williams said. 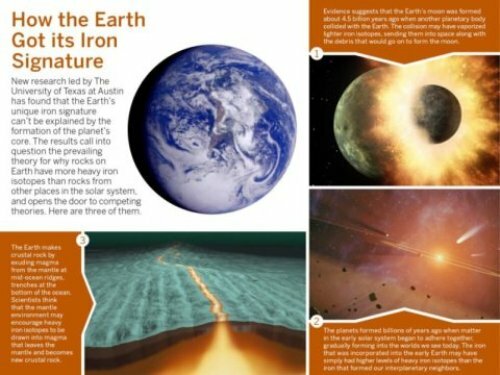 Lin said it will take more research to uncover the reason for the Earth’s unique iron signature, and that experiments that approximate early conditions on Earth will play a key role because rocks from the core are impossible to attain.